Ideal for sewing leather, canvas and similar materials. The awl carries a reel of black thread in the handle. 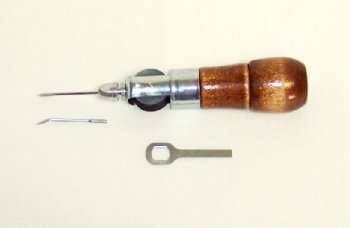 Hollow handle holds extra curved needle and wrench. Directions furnished with each awl explaining how automatic lock stitch can be effective in repair work. Comes with one strait and one curved diamond pointed needle.